During shoulder replacement surgery, the damaged parts of the shoulder are removed and replaced with artificial components, called a prosthesis. The treatment options are either replacement of just the head of the humerus bone (ball), or replacement of both the ball and the socket (glenoid). 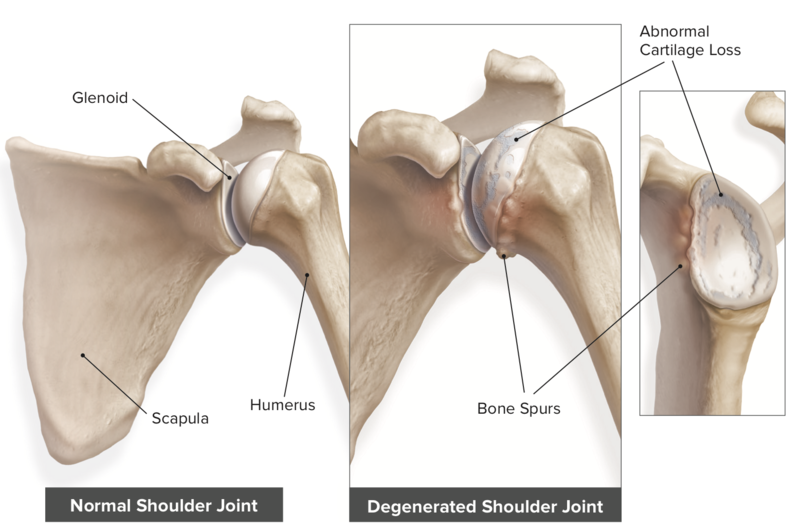 While shoulder replacements are not as common as hip and knee, they are just as effective in correcting advanced arthritis damages and helping alleviate pain. Once the decision for surgery has been made by the patient and Dr. Cook, the specific type of shoulder replacement will be determined. Dr. Cook utilizes computer-based, 3-D, virtual software to determine the correct size, location, and rotation of your shoulder implants to optimize your outcome. This enables him to know exactly where and how each component needs to be placed for your individual shoulder, prior to your arrival to the operating room. To accomplish this, he will ask you to obtain a CT scan performed according to specific instructions and then return the disk to any BJISG office location. The surgery is commonly an outpatient procedure, though overnight observation is sometimes required for medical or social reasons. In accessing the damaged bone, usually, a tendon must be cut and then repaired back at the end of the case. The repair must then be protected, usually by time in the sling after surgery and carefully directed exercises during this healing phase. Once the tendon heals, we will rapidly accelerate your return to activities. The shoulder is called a “ball-and-socket” joint, but really looks a lot more like a golf ball on a tee. The “ball” is the humeral head (the upper arm bone), and the “tee” is the glenoid (part of the shoulder blade). Both the ball and tee are covered in cartilage that helps promote smooth shoulder motion (think tread on a tire!). There are 23 muscles involved in the motion of the shoulder, and 4 very important ones are collectively called the “rotator cuff”. The rotator cuff is designed to center the ball on the tee during shoulder motion. Sometimes called degenerative joint disease or degenerative arthritis, osteoarthritis (OA) is the most common chronic condition of the joints, usually occurring in people 50 years of age and older. OA causes the smooth cartilage areas to wear away allowing the bones to rub against each other, causing shoulder pain and stiffness (no more tread on the tire!). This can follow a serious shoulder injury or fracture. The cartilage may become damaged and lead to progressive pain and stiffness over time, similar in effect to OA. Also called osteonecrosis or bone infarction, avascular necrosis (AVN) is death of bone tissue due to interruption of the blood supply. Causes can include trauma, such as a fracture, or chronic oral steroid use. Early on there may be no symptoms. Gradually joint pain may develop which may limit the ability to move. This is the result of a rotator cuff tear that has progressed to the point that the ball no longer rotates in the center of the tee, leading to abnormal rubbing between the two bones. This usually causes significant pain as well as progression to decreased motion and function over time. The most common replacement is the total shoulder arthroplasty (TSA). This can be performed when all of the surrounding tendons are normal. The damaged bone and cartilage are removed and replaced with prosthetic components that allow for smooth motion. A metal stem is placed into the humerus to anchor the new ball. The damaged cartilage surface of the tee (glenoid) is removed and replaced with a plastic surface. Cement is often used to secure the new glenoid. A metal ball is placed on the upper part of the stem. This ball replaces the damaged humeral head that was removed. Depending on other factors discussed prior to your surgery, such as age, quality or quantity of bone, rotator cuff integrity, or AVN, two variations may be performed. 1 – Reverse shoulder replacement (RSA): this procedure switches (reverses) where the ball and cup are located. It is often used if the rotator cuff has a longstanding tear or if the bone on the tee will not accommodate a plastic component. 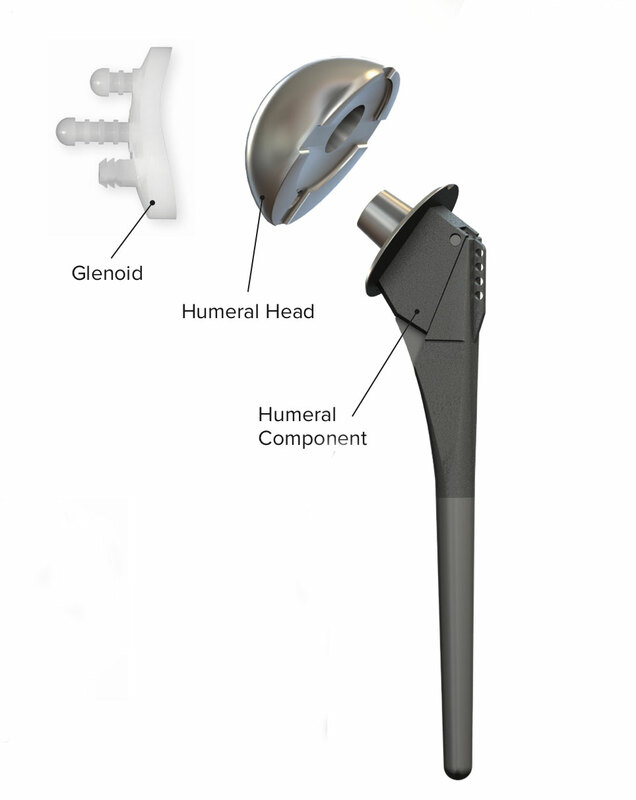 The damaged cartilage surface of the tee (glenoid) is removed and replaced with a metal ball. A metal cup with a plastic lining is placed on the upper part of the stem. This replaces the damaged humeral head that was removed. TOTAL SHOULDER REPLACEMENT TESTIMONIAL – HEAR DIRECTLY FROM THE PATIENT. Dr. Cook will review your medical history, perform a thorough physical examination and take x-rays of your shoulder. Other imaging and laboratory testing may be required depending on your individual case. Even if your pain is significant, and the X-rays show advanced arthritis of the joint, the first line of treatment is nearly always non-operative options. This may include oral medication, injections, therapy, or activity modification. If the symptoms persist despite these measures, and with corroborating X-rays, then you may be considered for surgery. The decision to proceed with a shoulder replacement is typically based on the pain and disability from arthritis influencing your quality of life and daily activities. Patients who decide to proceed with surgery commonly report that their symptoms consistently (more bad days than good) keep them from performing normal activities of daily living such as reaching cabinets, combing hair, getting dressed, or even sleeping. Surgery is the next option when non-operative treatments have failed. 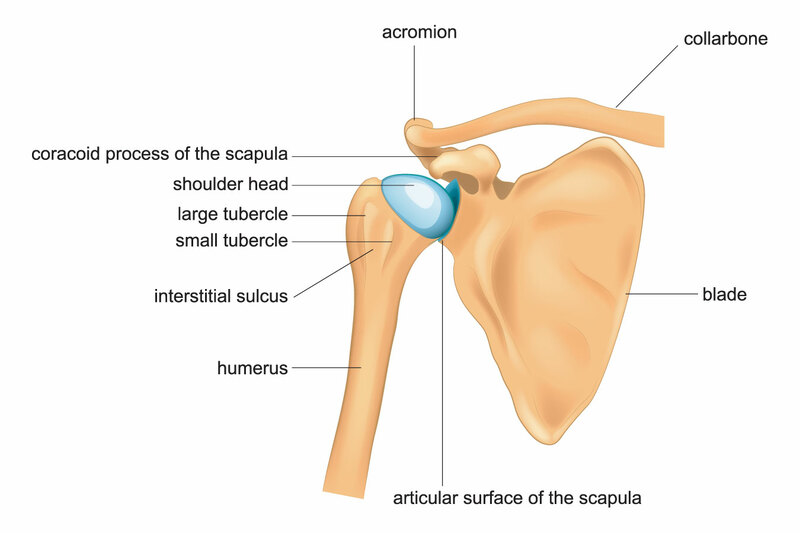 BELOW IS AN ANIMATION SHOWING THE TOTAL SHOULDER REPLACEMENT PROCEDURE. STEP 1 BE AS HEALTHY AS YOU CAN BE BEFORE SURGERY! Your health is our primary concern and we want your surgery to be as successful as possible. The following requirements are designed to improve the outcome of your surgery, decrease the risk for complications, and make your surgery as safe and effective as possible. Diabetics – Make sure your blood sugar control is extremely good in the weeks prior to your procedure. We will check your levels the morning prior to surgery and it must be less than 120. If not, your surgery will likely be postponed. Smoking – If you are a smoker, we insist that you stop smoking at least 1 month prior to your surgery and continue to not smoke after surgery as this will help the healing process. You must stop smoking! Nourishment – It is vital that you take care of yourself and eat a healthy diet consisting of plenty of vegetables (green and other colored) and proteins (eggs, bacon, beef, pork, poultry, fish (no batter please). Cut out all unnecessary sugars and starches (the “white stuff” such as bread, rice, grits, potatoes, corn, chips, sodas and junk food in general). Try to eat well-balanced meals to give your body the nutrition it needs to heal. Skin – It is important to take care of your skin in the weeks prior to surgery! No bug bites, scratches, infected lacerations, etc – these allow additional places for germs to hide. Dental – Make sure your dental health is good – no abscessed teeth/infections, etc. Toe & Fingernail health – This must be excellent. No draining, bleeding, inflamed, infected or ingrown nails. Narcotic Pain Medications – Discontinue these medications if at all possible. PLAN FOR YOUR SURGERY: BEFORE AND AFTER! Make sure to plan for the fact that you are having surgery. Attend your Pre-Op appointment with you. Bring you to the facility on the day of surgery. Drive you home and help you into your residence. Make sure you have friends and family lined up to help you during the healing process. Make sure there are no trip hazards at your home. You will be given a prescription for pain medications before surgery – make sure someone can get it for you. Become an active member in your recovery process. You can do this! Your determination to succeed is critical! CT Scan– We will require you to obtain a specific CT scan that we will order for pre-operative surgical templating; having the CT performed at Wayne Memorial Hospital is preferable, if you go somewhere else, you will need to return the disk to any BJISG location prior to being scheduled for surgery. Laboratory Screen– Blood work will be drawn and reviewed. Surgical Clearance– If needed, we will obtain or review surgical clearance from your current primary care physician and/or specialist (cardiologist, pulmonologist, neurologist, etc.). Patient Champion– Make sure to bring your patient champion with you if at all possible. Questions– Final questions and plans discussed with Dr. Cook. Your pre-op appointment will be held at the surgical facility. Pre-SurgeryTesting– Additional blood will be drawn for labs and an EKG will be taken. Final Surgery Consult– final details will be discussed prior to surgery. We will explain what and when to stop taking medications at this point and which need to be continued. Prescription Drugs– Discontinuing prescriptions that “thin” the blood as directed by your physician(s), such as aspirin is necessary prior to surgery. Any Narcotic/Opioid medications must be stopped prior to surgery as well. Food/Drink– Patients must refrain from eating or drinking as directed at the pre-op appointment. Make sure that you are well nourished and hydrated in the days and weeks prior to surgery (Water, Gatorade, etc.). Physical Therapy – You will receive some basic instructions for shoulder motion and restrictions immediately after surgery, as well as instructions in applying and removing your sling. Refer to your shoulder replacement handout for more detailed instructions on activity. Arrive at the surgical facility at the appointed time (with your patient champion). Diabetics – blood sugar checked and must be below 120. Meet with anesthesiologist and operating room nurse. Dr. Cook will see you, answer any last questions and “sign your surgical site”. Ongoing monitoring of vital signs until condition is stabilized. Diet of clear liquids or soft foods, as tolerated. Begin post-op activities taught during pre-op visit. Ability to urinate and have a bowel movement. No medication interactions or adverse side effects. Ability to tolerate eating and drinking. Pain reasonably controlled with Oral Medications. Diabetic patients must have their blood sugars well controlled. If you are released the same day, your patient champion will drive you home and help you into your house. YOU WILL BE GIVEN SPECIFIC DISCHARGE INSTRUCTIONS FOR YOUR CARE AFTER YOU LEAVE THE SURGICAL FACILITY. CLICK HERE TO VIEW THESE INSTRUCTIONS. STEP 7 Follow Your Rehabilitation Protocol!!! Your new shoulder parts are firmly fixed, HOWEVER, the tendon that was cut in order to access the shoulder must heal in order to maximize your outcome. Protect this repair! Do NOT reach out to the side! Do NOT reach behind your back! As a simple rule of thumb, if you hand is in front of your stomach, your shoulder is in a safe place. You will be given specific REHABILITATION and AT HOME EXERCISES for your care/recovery after you leave the surgical facility. CLICK HERE TO VIEW THESE INSTRUCTIONS. Dr. COOK WILL SEE YOU AT YOUR TWO-WEEK APPOINTMENT, AND WE WILL MOVE ONE STEP AT A TIME TOWARDS A FULL RECOVERY!! FREQUENTLY ASKED QUESTIONS – Click Any Question Below For The Answer! What I can expect of my shoulder after shoulder replacement surgery? Ultimately, you should expect a significant reduction in pain and improvement in functionality for daily living activities. Everyone’s situation is unique and therefore results very. Although your shoulder will likely feel much better than it did before the surgery, the shoulder replacement is made of artificial parts and cannot be expected to function or feel like the shoulder you had when you were 16! Why do I need to lose weight for surgery? Depending on your Body Mass Index (BMI), you may be told that you need to reduce your weight prior to surgery. People with a BMI score of over 40 can have a much more difficult time healing and have an increased risk of complications. • Falls resulting in catastrophic injury to the new and healing shoulder replacement. CLICK HERE TO FIND OUT WHAT YOUR BMI SCORE IS AND MORE INFORMATION ON THE SUBJECT. What are potential complications of a total shoulder replacement? Your surgeon and the entire surgical team have worked diligently to put together a program that significantly reduces the risk of complications. Over the last few years the complication rates have definitely been reduced, but the potential for complications still exist and has not been completely eliminated. • Ability to get from the bed to the bathroom and back to the bed safely. • Ability to walk 50 feet down the hall and back. • Nausea and/or vomiting controlled. • No medication interactions or adverse side effects. • Ability to tolerate eating and drinking. • Pain reasonably controlled with Oral Medications. • Diabetic patients must have their blood sugars well controlled. How long will a new shoulder joint last? • Shoulder replacements do wear and can eventually wear out. Unfortunately, an artificial shoulder is not as durable as your own natural shoulder. Because the shoulder replacement implants are made of metal and plastic, these materials do wear over time, similar to the treads on your car tires. • Studies show that shoulder replacements can last up to and longer than 15-20 years. This is dependent on many factors. Activity level, weight, and age of the patient can affect the longevity of the joint. In general, we expect around 85% of shoulder replacements to be still functioning well after 15 years. My friend’s shoulder replacement makes an occasional pop or click. We will my shoulder replacement do that? •	Total shoulder replacement implants can often feel slightly abnormal and might make a slight snap or popping sound with certain activities or maneuvers. Typically, this is painless and does not present any problem. After surgery, is recovery very painful? • You may have relatively mild to moderate pain following the procedure, or you may have a more difficult time than others. Everyone is unique, handling and perceiving pain differently. Keep in mind that while pain management has greatly improved, a pain-free surgery is unlikely. You will want to take your pain medicines as directed by your surgeon. The instructions on the pill bottle describe the maximum dose and frequency of the prescribed pain medicine. It is preferable to reduce the number of narcotic pills taken as much as possible and minimize the amount of narcotic/opioids consumed. • Most patients report fairly rapid relief of pre-operative pain. However, there will be surgical pain. Surgical pain will typically improve drastically over the first couple weeks. •	Typically, the incision will be about 5 inches long but depends on the surgical needs. Your surgeon will make the incision as small as possible, but the priority will be on being able to see everything to perform an excellent surgery. Will my terrible stiffness effect my outcome? • Severe stiffness is common in arthritis of the shoulder, many times due to the osteophytes (bone spurs) located in the joint. Correcting the deformity at the time of surgery is typical and a routine part of shoulder replacement surgery. After completion of the procedure, your shoulder should be able to recover much of the motion that was gradually lost due to your arthritis. Will I be able to reach above my head with my new shoulder? •	Typically, regaining the ability to reach overhead after progressing with therapy is expected. Each shoulder replacement has its own set of circumstances and some may achieve a little more or a little less motion. The ability to reach the back of your head or to get a cup out of a cupboard is a reasonable expectation in most instances. •	Typically, a nerve block is used in conjunction with general anesthesia. There are other options available as well depending on what is best for each patient. How long will I stay at the hospital or surgical center? •	It varies. Most patients will go home the same day, while some may need to stay overnight for observation. This is highly dependent upon your condition before surgery, your age, and medical problems which can influence your recovery. A safe discharge plan will be arranged for you by our orthopaedic team. • The majority of people who undergo total shoulder replacement are able to participate in a majority of their daily activities by 6 weeks. By 3 months, most people have regained much the endurance and strength lost around the time of surgery, and can participate in daily activities without restriction. While daily activities have resumed, it is important to avoid high impact activities to give you the best long-term outcome with your shoulder. • You can expect the majority of your recovery to occur within the first 12-16 weeks following shoulder replacement surgery however you can also expect the new shoulder to continue to slowly improve with respect to swelling, strength, and function for up to a year following the shoulder replacement procedure. •	Yes. In contrast to hip replacement surgery, almost all shoulder replacement patients require formal physical therapy in order to maximize the results of the shoulder replacement surgery. Ideally, this is performed at an outpatient physical therapy facility close to your home following your discharge from the hospital. Number of days per week and number of total weeks will vary from person to person. The goal is to keep making progress. •	We used advanced water proof bandages so you typically can take a shower 3 days postoperatively. Do I need to wear my sling all the time? •	You will need to wear the sling for most of the time for the first 4-6 weeks. You may come out of your sling when you are AWAKE and IN CONTROL of the shoulder to rest your shoulder, stretch your elbow, and move your wrist. When you are NOT in control of the shoulder (crowds, sleep, etc.) please use your sling to protect the shoulder. The sling is there to remind you to avoid reaching out to the side or reaching behind your back while your shoulder is healing. •	It depends. You may NOT drive if you are still taking narcotics. Depending on your insurance, there may be a policy for proximity to surgery or use of a sling. In general though, if you have an automatic transmission, driving with one arm is achievable. Around 6 weeks postoperatively, both arms should be able to be used to maneuver a car. •	Returning to work is highly dependent on your general health, activity level and the physical demands of your job. If you have a sedentary job, such as computer work, you can expect to return to work in two to three weeks. If you have a more demanding job that requires lifting or travel, you may need up to three months for full recovery. What restrictions will I have after surgery? •	Very few. We advise against any extremes – no extreme positions or activities. Heavy weight lifting or heavy overhead lifting will put your new shoulder at risk of failing. However, most activities of daily living and most recreational activities should be well tolerated. Will my implant set off metal detectors at airports and courthouses? •	Usually patients with joint replacements will set off metal detectors. This should not be of great concern. It is reasonable for you to inform the TSA screening agent at the airport that you have had a joint replacement; however, you will still require screening and will need to follow the directions of the screening agent. There are millions of individuals with joint replacements, and screening protocols recognize that people who have had joint replacements may set off detectors. Joint replacement documentation is not required. Will I need to take antibiotics prior to seeing a dentist or having other surgical procedures? • The American Academy of Orthopedic Surgery (AAOS) and American Dental Association (ADA) have generally recommended short-term antibiotics prior to dental procedures (one dose one hour prior to dental procedure) for patients who have had joint replacements. This recommendation continues for up to two years after your joint replacement. • Two or more years after the replacement, continued use of antibiotics prior to dental procedures is based on the discretion of the treating surgeon and the patient. Your surgeon will consider many factors including whether or not you are at increased risk of infection due to immune suppression (i.e. diabetic, transplant patients, and rheumatoid arthritis). • The use of prophylactic antibiotics prior to dental cleanings and other invasive procedures remains controversial. Most orthopaedic surgeons now recommend lifetime prophylaxis. Patients should discuss whether or not they need antibiotics prior to dental or other invasive procedures with their treating orthopedic surgeon. Should I continue to see my surgeon after I’ve healed? • It is important to follow up with your surgeon after your joint replacement. In most cases, joint replacements last for many years. • The frequency of required follow up visits is dependent on many factors including the age of the patient, the demand levels placed on the joint, and the type of replacement. We will consider all these factors and tailor a follow-up schedule to meet your needs. • In general, seeing your surgeon every three to five years is recommended. 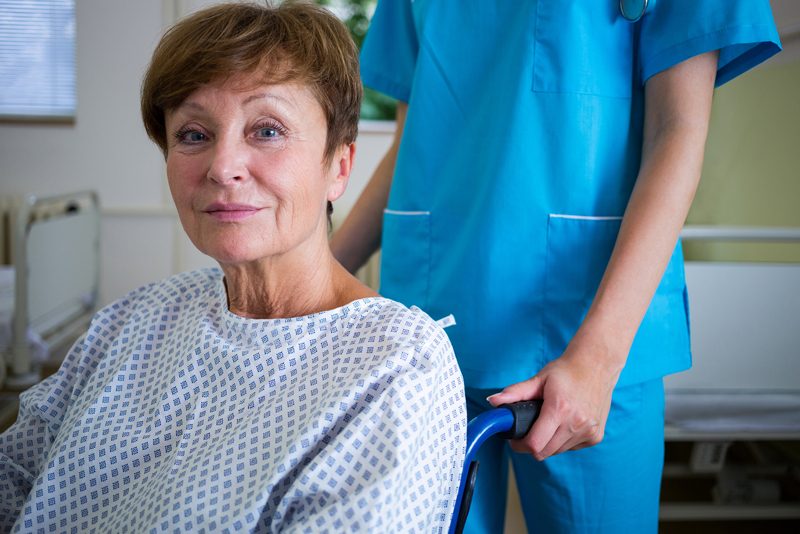 Are there specific instructions for care after surgery? Yes. We have prepared a two-page document with instructions for your specific care after a total shoulder replacement. • WHEN TO CALL YOUR DOCTOR. Click here to download these specific instructions.